All calls are confidential. The identity of the caller will also remain confidential. 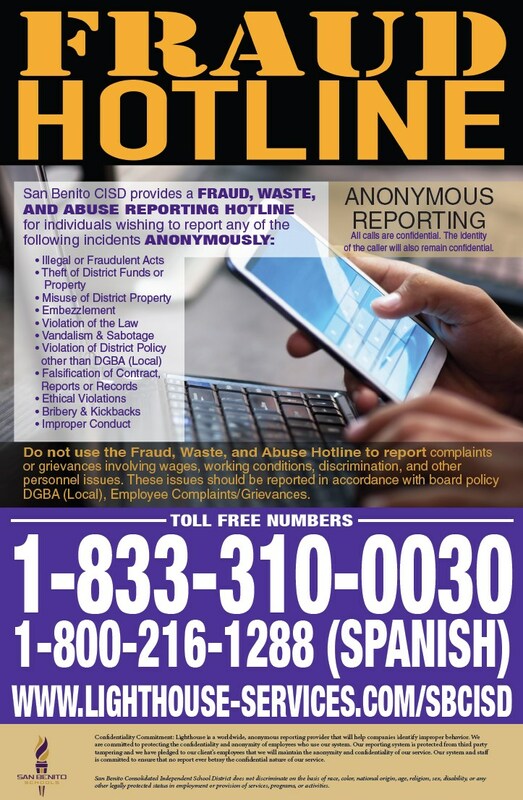 Do not use the Fraud, Waste, and Abuse Hotline to report complaints or grievances involving wages, working conditions, discrimination, and other personnel issues. These issues should be reported in accordance with board policy DGBA (Local), Employee Complaints/Grievances. A service provided by Lighthouse Services, Inc.
Lighthouse is a worldwide, anonymous reporting provider that will help companies identify improper behavior. We are committed to protecting the confidentiality and anonymity of employees who use our system. Our reporting system is protected from third party tampering and we have pledged to our client's employees that we will maintain the anonymity and confidentiality of our service. Our system and staff is committed to ensure that no report ever betray the confidential nature of our service.